Inspired by the classic dessert! 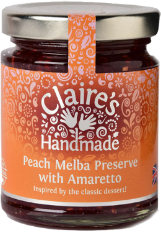 The distinct sweet, juicy flavour of sun ripened peaches combined with slightly tart raspberries makes a delicious combination only bettered by the addition of amaretto. Perfect on scones, toast or freshly baked bread.